Vocus.io has native support for Salesforce. 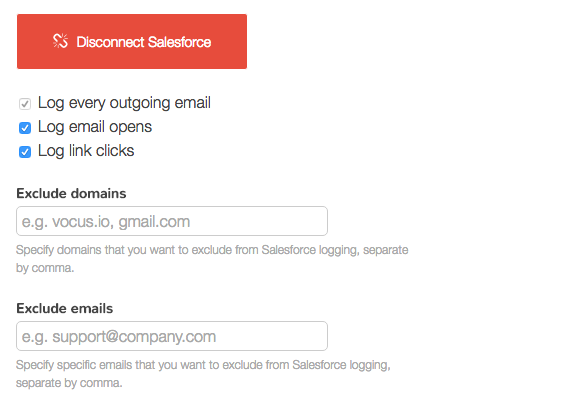 It will log all your outgoing messages, email opens, and link clicks to Salesforce. This includes regular emails, scheduled emails, emails from automated followups, and emails from mail merge. To enable Salesforce integration, go to Dashboard > Settings and follow instructions from there. Every activity (email sent, opens, clicks) will be logged as completed tasks in Salesforce. Vocus.io will attempt to associate a task with a Salesforce Contact by matching the recipient email with the emails found in your Salesforce. If no Contact with the same email is found, the task will still be created to allow you to resolve the associations later. In addition to logging a message as "Sent", you can also log email opens and link clicks. Vocus.io allows you to exclude logging emails to individual addresses or whole domains, such as your teammates, by specifying the addresses and the domains in the fields above. Sometimes you'll want to log an email that you received or a reply to your message. 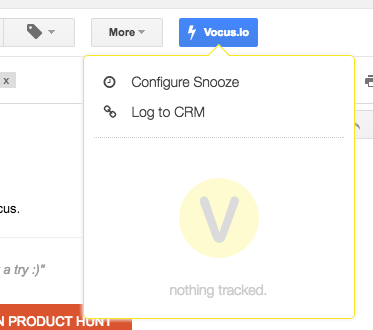 This can be accomplished with two clicks: open the email that you want to log, click on "Vocus.io" button on top of that email, and choose "Log to Salesforce". Your email will now appear as a Task under the correct Contact or Account.